GSE Design Classrooms and Schools with a Difference! This is what classroom design, learning and planning for learning sometimes sound like today. Schools are certainly not what they used to be. What is a classroom design today? 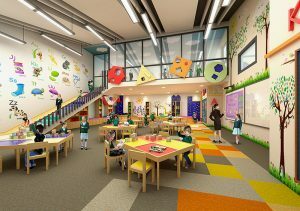 Look at this new design we just created in Malaysia with our partner Architect Sayhan Lim and Kingsgate International School. We face a new paradigm. We face a time when new research has proven what strategies accelerate and retain learning. Children learn differently now and we recognise the value of different learning styles.